Hey Guys, I awoke this morning to find a brand new MOTUC Tri-Klops on my doorstep. It would seem that after i complained about the lateness of my CyberMonday sale items the sent me a replacement. Of course the Tri-Klops and Webstor (Sorry, I didn't get a replacement Webstor) I ordered came a bout a week after they shipped of the replacement. Oh well. 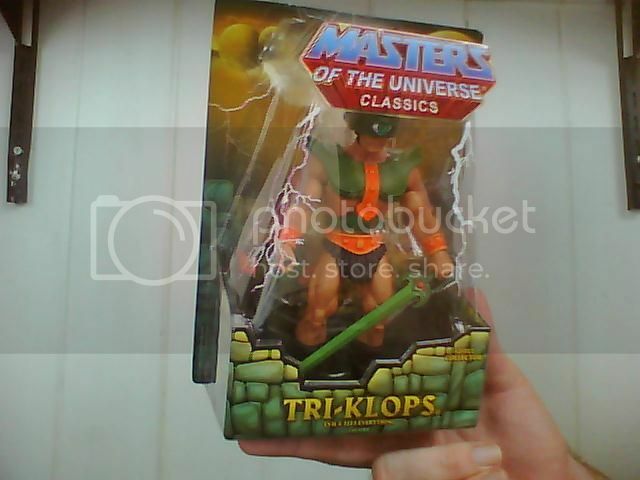 So I have for sale one unopened MOTUC Tri-Klops. I think $20 and postage is quite reasonable, OR if Brisbane or Gold Coast members are willing to meet or pick up the item that would acceptable. I've made certain the figure is free from defects, everything is where it should be. there is a small white fleck of paint visor but i think it could be easily removed or ignored. I'll be mailing him or handing him over in his white mailer box as well. he is available for anyone who wants him. First come first served etc. thanks dude, just got him today. looks bloody great! Awesome man, he's one of my fave MOTU villians and I thought I'd share the love!